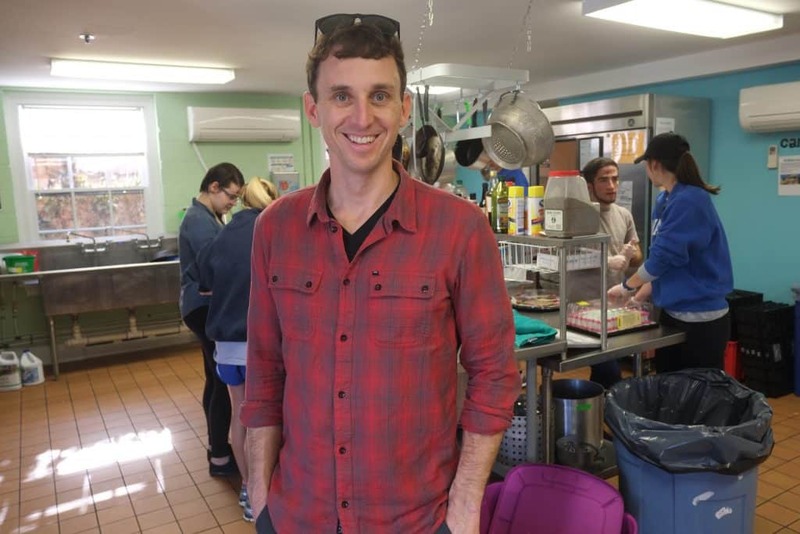 While visiting the campus in March 2016, David Hanson ’00 helped prepare meals at W&L’s Campus Kitchen. He discovered geology through Professor Dave Harbor’s Intro to Geology class. “I instantly connected with the stories of how the landscape has taken its shape over time,” said Hanson. “I always enjoyed Professor Harbor’s incessant questioning and curiosity and genuine joy about the story of geomorphology — basically, why the land looks the way it does.” English, particularly with Professor Dabney Stuart, was also a favorite. “It came relatively easy to me, compared to math, so I gravitated toward it. Again, the stories attracted me. Since graduating with a double major in geology and English, he’s worked as a field science instructor in Olympic Park Institute and Yosemite National Institute and as a features editor for Cottage Living Magazine. He is now a freelance writer, photographer and videographer, most recently producing stories for the nonprofit WhyHunger about food justice — how food is grown, processed, transported, distributed and consumed. “I like telling stories, and there are a lot of them out there,” he said. As recounted in the Spring/Summer 2012 issue of the W&L alumni magazine, Hanson and his brother, Michael ’03, along with Marty, hit the road in a short Blue Bird school bus that ran on a combination of recycled vegetable grease and diesel fuel. Christened Lewis Lewis, the bus was outfitted with three bunks and two desks and conveyed them, with some breakdowns along the way, to a dozen cities, including Seattle, New Orleans, Chicago and New York. “Lewis Lewis proved to be a pretty good conversation opener with people, maybe because it smelled like French fries,” he said. Along the way, Hanson collected stories about refugees from Burma and Somalia raising crops to supplement their income and as a resource for creating native recipes. In Detroit, he met with members of the Catherine Ferguson Academy, which offers an alternate curriculum to help teenage mothers and their children learn viable skills through raising livestock and building chicken coops. He interviewed rooftop gardeners in New York City about supplying fresh produce to restaurants. Recently, Hanson added documentary filmmaker to his résumé. He grew up three miles from the Chattahoochee River, in Georgia, and it became the focal point for his film documenting the decades-old battle among Georgia, Alabama and Florida for the rights to the water from it. Not so long ago, the American South seemed impervious to water-shortage problems, but the needs of rapidly growing urban areas, such as Atlanta, began to clash with agricultural and recreational uses. “Who Owns the Water” garnered widespread praise, winning the 2013 AI-AP International Motion Award; Best Documentary, 2014 Lookout Wild Film Festival; 2013 Mountainfilm Grant; and Official Selection, 2014 Mountainfilm Festival. While the tug-of-war continues, Hanson will keep on gathering stories and writing not only about the river he knows so well, but other environmental issues, too.